Alcohol content is the measurement of ethanol content etanolo in an alcoholic beverage. In cider constitutes an important quality parameter. 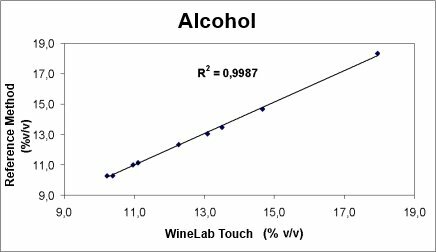 The determination of alcohol by volume with CDR CiderLab is simpler and more rapid than OIV method, OIV methods: it consists in a simple photometric reading and operates on a small sample of cider as is without any distillation. The analysis has a high repeatibility and reliable. The results you obtain with CDR CiderLab are compliant with the results of OIV reference analytical methods. The correlation curve between the CDR CiderLab analysis method and the reference analysis method. Codice *300600: The kit is constituted by 10 *300603 kits and allows 100 determinations. The analysis requests a rapid and simple dilution of the sample. The test is suitable for sweet cider as well, because it is able to measure up to 20% v/v. Alcohol was last modified: December 30th, 2018 by CDR s.r.l.